Historically, the “platform” refers to an organizational structure for political activity and revolution that emphasizes collective work, and “encourages inclusivity” through setting up alternative systems for sharing resources . 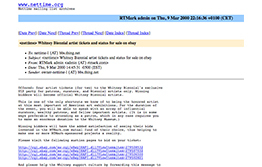 Before the advent of the Internet, art groups such as the New York Correspondence School, the International Mail Art Network, the Nouveau Réalistes, and Fluxus enacted this idea of the platform by taking advantage of communication technologies like the postal system as paths for sharing ideas. #exstrange taps into the idealism of this vision by utilizing online commerce as a tool for interconnection, shared interests, social responsibility and exchange. 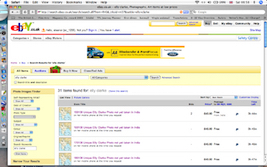 We see eBay as an economical platform offering artists access to worldwide networking activity. The encounter between the machine and the human has the potential to disrupt existing systems of value and production of knowledge. 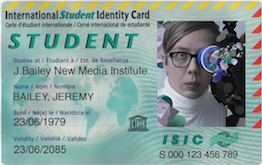 We think this mode of work will transform already existing transactional forms into forms of exchange between humans across geographical, social and political boundaries. We consider the projects presented on this page to be within the family of #exstrange. Help us to extend this family by sending news of other projects to curators@exstrange.com. 1. Olga Goriunova, Art Platforms and Cultural Production on the Internet (New York: Routledge, 2012), 8. Perpetual online auction, internet connection, custom programming and hardware, acrylic cube. 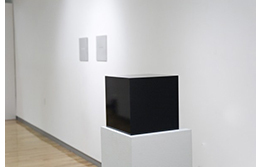 Combining Robert Morris’ Box With the Sound of Its Own Making with Baudrillard’s writing on the art auction this sculpture exists in eternal transactional flux. It is a physical sculpture that is perpetually attempting to auction itself on eBay. To raise money so I could attend the Trans Siberian conference I was invited to join in 2005, I sold photos I had not yet taken via ebay.co.uk. I pledged to take two photo a day – one at 10am, the other at 4pm for the 10 day duration of the journey with my analogue camera. When I returned to the UK I sent single-edition, signed, rubber-stamped prints to the buyers along with a contact sheet and list of titles. 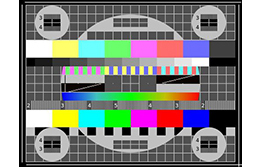 The series has since been turned into a limited edition set of 21 postcards. 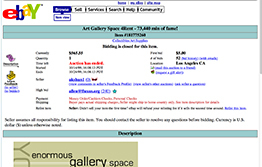 Art Gallery Space 4Rent – 73,440 min of fame! 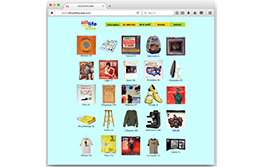 “On Oct.15, 1999, a collective at the California Institute of the Arts in Valencia, known as the AKSHUN group put the school’s main gallery up for auction on popular internet auction house eBay. The AKSHUN collective auctioned a week of gallery time, or, as they put it, 73,440 minutes of fame. 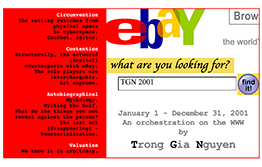 From January 1 to December 31, 2001, Nguyen produced a complete INVENTORY of everything in his Brooklyn studio/apartment using Ebay as the mechanism, thus playing all the roles on the website that normally exist in the art world (artist, curator, auctioneer, etc.). 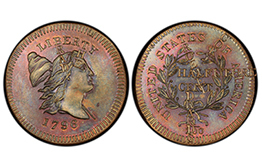 Every object was photographed and described similarly to condition reports at museums. In addition, Nguyen subversively embedded additional projects within the project, including selling “conceptual objects” (such as “Nothingnesss”) and incorporating a “live photo album” that involved the artist shooting an image each day and auctioning it on Ebay that same evening. 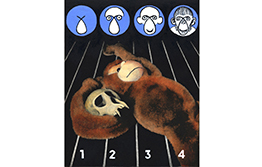 There were 1001 auctions total, and Nguyen subsequently published these records as an encyclopedic set a decade later. 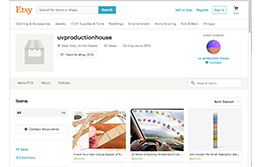 The first group curatorial project on eBay, eBayaday consisted of 25 auctions (one debuted each day for a month). Works presented in the show exploited, redefined or underscored eBay’s potential in the exchange of ideas, objects and money. “I’ve created this Kickstarter campaign to experiment with new form of art exhibition and approach to selling work. I’ve asked 11 artists to create new works that fit into the Kickstarter format. 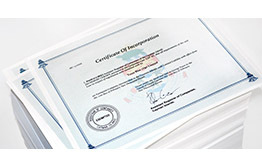 In response, they have each designed a custom artwork through online retailers in editions of 10, and assigned a value for these mediated works. Throughout the course of this campaign, I’ll be interviewing the artists, educators, writers, and other interested parties about where the art world stands today–both as an institution and a means of livelihood–and how crowd-funding may continue to impact the economy of artistic practice. Opening October 11th, the culmination of this project will be presented at Ditch Projects, a gallery in Springfield, Oregon. The physical exhibition will display a single edition of each artwork, as well as the video documentation.” (From the project Kickstarter page). “I am creating a series of important augmented reality portraits of YOU, the under-appreciated KickStarter backer, to be exhibited in a solo exhibition at Pari Nadimi Gallery April 4th – May 4th 2013. 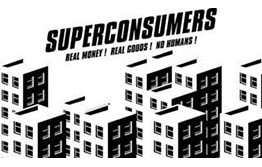 Inspector London – from Marx to Mobiles The consumer as designer/producer – a sketch of contemporary consumption/production landscapes. 1. 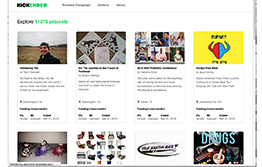 Kickended is an archive of Kickstarter’s $0-pledged campaigns. 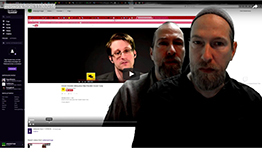 Kickended is the place where campaigns with no backers live a second life. Free from the pressure of money raising, these retain the purity of abstract ideas. 2. 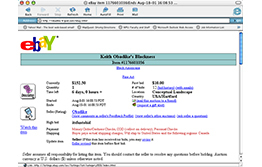 Kickended used to grab data from kickspy.com. 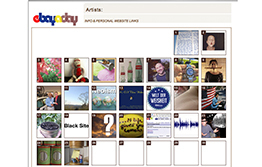 In short, Kickspy was a means to easily discover, research and track Kickstarter projects. 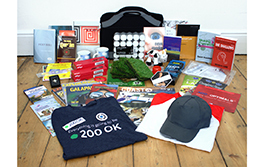 Kickspy was originally started in October 2012 by Walter Haas and came out of his passion for backing Kickstarter projects and his frustration at not being able to find them more easily. 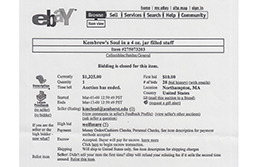 Kickspy made the hard decision to shut down on 31st March 2015 for unspecified reasons. If you know of a similar online service, feel free to drop a line. This is the highly sought after Blue Box Kid box of Grand Prize Winner, Natasha, age 5, Illinois. Little Natasha is so cute with her adorable baby teeth smiling at us, a true jewel, a diamond in the rough, [as they say: “…sugar and spice and everything nice…”]. Package condition: Slight crushing on the cardboard down near the bottom lefthand corner, other than that this is mint, unopened! Macaroni and cheese packet is well preserved inside. This is the 7.25 oz size (206 g) of the cheesiest original flavor M & C dinner, expiration date March 7th, 1999. This is the real thing! WARNING: I *will* eat this box for dinner if reserve is not met!! !$3.00 priority mail (4.00 outside of US) People with negative feedback pay by money order only. 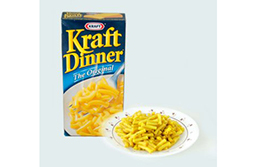 No Kraft employees may bid on this item. The value on this item is getting astronomical, BID NOW! $20 Reserve. 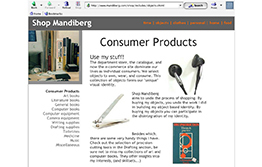 Shop Mandiberg was an e-commerce site which aimed to market and sell every last one of Michael Mandiberg’s personal possessions. Everything was for sale, from his underwear to his favorite coats ‹ his apartment keys, to his mostly used jar of strawberry jam. 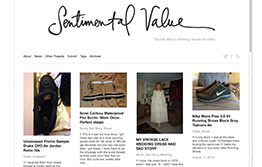 The experiment’s curators purchase objects — for no more than a few dollars — from thrift stores and garage sales. A participating writer is paired with an object. He or she then writes a fictional story, in any style or voice, about the object. Voila! 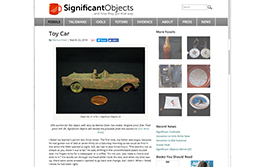 An unremarkable, castoff thingamajig has suddenly become a “significant” object! 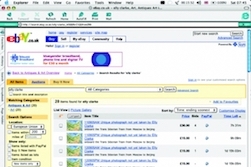 Each significant object is listed for sale on eBay. The s.o. is pictured, but instead of a factual description the s.o.’s newly written fictional story is used. 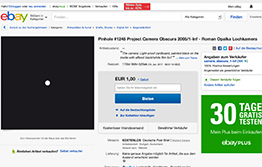 However, care is taken to avoid the impression that the story is a true one; the intent of the project is not to hoax eBay customers. (Doing so would void our test.) The author’s byline will appear with his or her story. 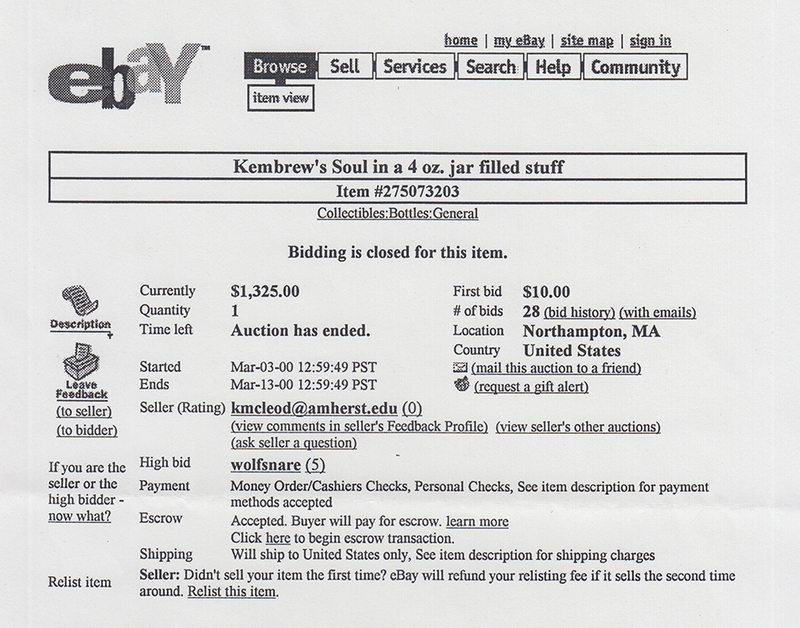 The winning bidder is mailed the significant object, along with a printout of the object’s fictional story. Net proceeds from the sale are given to the respective author. Authors retain all rights to their stories. “In the Zero Sum Art Project, I explored the basic alchemy of artwork, that strange situation where base raw materials gain value through their transformation, in an enormous leap of faith, into art. Towards that end, the project was a self-contained studio in which all costs and profits were made visible to the viewer. Central to the project was an entirely absurd business plan that did not allow the studio to make a profit, and killed the studio if it stayed in the red. The seemingly poor business practice of putting every last cent of profit back into the studio, leaving the balance as close to zero as possible, always left the project teetering on the brink of disaster.